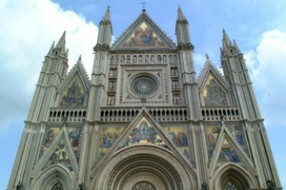 The work for Orvieto Cathedral construction started in 1263 under the pontificate of Urbano IV. The Pope wanted to consecrate in this way the so-called "miracolo del sangue": during a Mass officiated by a Bohemian priest in the Saint Cristina Church in Bolsena, during the Eucharest, blood gushed out from the broken Bread and fell on the body, now sealed into a beautiful Gothic Reliquary. The visitor's attention is immediately drawn by the wonderful Gothic facing, on which one notes a polyptych decoration of mosaic works and bas-reliefs . Inside, some chapels are structured with cross vaults, some of which embellished by very important frescos painted by Frà Giovanni from Fiesole and by Luca Signorelli. In the transept one may admire a Pity from the 16th Century.